Bolivian folklore 101: Caporales dance, how it was created! From time to time we see/read about Chile, Peru, Argentina, Ecuador folklore groups playing our music, as if it were their own. I recall been in Germany and not so long ago in Charles Square, Cambridge, MA, USA, where musical groups from other countries were playing Bolivian music as if it was originally from their countries. Bolivian folklore music/dance is beautiful and so there is no doubt, here is the story about the Caporales dance! Step by step, to the rhythm of the bells of their boots and the rhythmic movement of their shoulders, it was igniting, the excitement on the faces of the brothers Jorge and Carlos Estrada Pacheco, while they danced the dance that fascinates them since they were young people. Thus, two of the nine brothers Estrada Pacheco did not hesitate to immediately put their suits and show some steps of the rhythm that inspired them to create the caporal dance little more than 40 years ago. It was not difficult to locate them in La Paz. And it is that, due to their active participation as defenders and promoters of Bolivian folklore, passion that they say was by having inherited from their parents, they are very well-known in the area of Gran Poder [a neighborhood, great power] and were also deserving of several awards at national and international levels. Despite the passage of the years, the enthusiasm of this family for this dance remains the same. Today, with ages ranging from 65 to 45 years, the Estrada Pacheco brothers, continue to show the beauty of this dance in events to which are invited inside and outside the country. While not everyone can attend due to problems of health or their work occupations, they ensure that they will always look for the way to participate in these activities to show the folk and cultural wealth of the country. 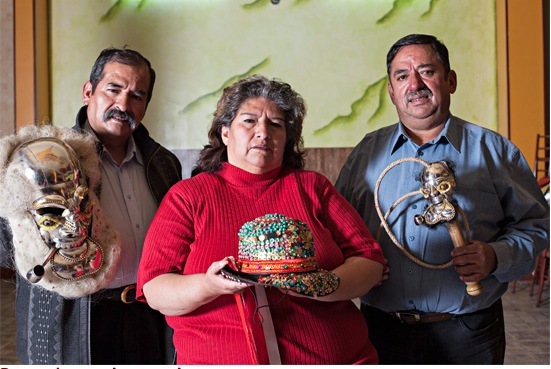 Eva, Victor (+), Vicente, Jorge, Carlos, Remy, Lidia, Zeno and Moises are the nine sons of Victor Estrada Mariaca (+) and Elena Pacheco Villegas (+), a couple passionate about Bolivian folklore than in life was able to spread that passion to their offspring. According to Carlos and Jorge Pacheco in the world of folk dances his parents gave the first steps of the Estrada brothers in the fraternity “Wacatocoris Rosas de Viacha” which formed part of. According to what they say, older siblings integrated initially into that artistic group, dancing like k’usillos, a kind of native jester without following a certain choreography dedicated to move from one side to another teasing or making mockery of the people who were in the surroundings. Creativity began to emerge between those intrepid dancers (which then were between 14 and 18 years of age), since, they say, they were able to convert that improvised dance into a dance with its own steps that they were inventing. Driven by the strength of the youth after the Estrada Pacheco brothers, along with some of his friends from the Chijini neighborhood (currently zone of Gran Poder) where they lived, decided to form a dance group that continued showing their skills for various folk dances, among them “la diablada”, the “morenada” and the “kullawada”. Just at the end of the 1960s is when the Estrada Pacheco brothers feel the inspiration to create the caporales dance after observing how danced a group of African-Bolivian [afrobolivianos] settlers of Tocana [Tocaña] (community of the Sud Yungas region), that group was taken to the city of La Paz by the employer of folkloric shows, Alberto Pacheco Villegas. According to Carlos and Jorge, that businessman journeyed to that community upon learning that there was an attractive dance called “saya” in that region. Already there, Alberto Pacheco was impressed with the cadences movements of the yunguenos [citizens from the Yungas region, yungueños] and decided to invite them to show their dancing in the paceña [La Paz] city. He had to apply for the authorisation of ‘El Capo’, caporal, a man with a peculiar aspect: tall, black, dressed with wide trousers and a high hat for cover from the sun. Also had bells on his boots announcing his presence as he was walking. In exchange for approving the travel of the residents of this community, they recall he has asked a few cans of sardines. When the Estrada Pacheco brothers saw the dancing of the yunguenos they were so surprised and excited that they quickly were “infected” by its joyful rhythm. Their imagination again returned to fly. That is so that by mixing a little of each of the movements that seduced their senses until then (like the tuntuna yunguena, the dance of the “kusillos” and others) they managed to give birth to the caporal dance, inspired by the costumes and the music of the “afro-bolivian saya”. Victor Estrada Pacheco, who died in 2007, was the leader who pushed that initiative, which was closely followed by his other elder brothers and then by the rest of the family, which until today continues dancing the dance. 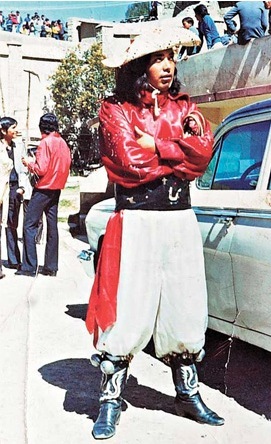 The first costume that the Estrada Pacheco brothers devised for los caporales dance was nothing complicated. Jorge and Carlos explained that the costume for men included a wide-sleeved red shirt, white sweatpants, a black sash, boots with bells and wide-brimmed straw hat. “The first choreography that we wit, was also simple and included five steps between jumps, twists and movements of the shoulders,” explains Carlos. In terms of music, Carlos indicates that the group Los Payas composed the first rhythms and that later were already interpreted by a band of music. 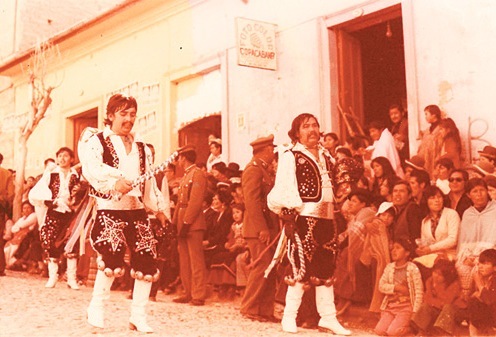 After creating the choreography, costumes and some of the music of the caporal, the Estrada Pacheco brothers formed in 1969 the “Caporales Urus del Gran Poder” fraternity and after many performances, in 1972 decided to publicize that brand-new dance in the most important folk event in the city of La Paz: the lavish entrance to the “Senor del Gran Poder” [Lord of Preat Power]. That presentation caused such a sensation that they were able to carry the big prize of that folk festivity. From that moment, the Estrada Pacheco brothers and his group began to reap more successes. Its fame went beyond the borders of Bolivia and they were invited to participate in several international events. Jorge, Carlos, Lydia and Moises Estrada Pacheco observed with joy and excitement the national and international impact of the dance, one of the most important of Bolivian folklore. “I feel happy and honored to have contributed to the birth of a Bolivian dance that has been so successful. I feel great affection and respect by the national folklore, affirms Jorge Estrada Pacheco, one of the older brothers, currently retired. Carlos, who is engaged in trade, said he felt very proud everytime he hears the rhythm of the caporales. “It’s nice to see young people enjoy national music. We want to continue promoting this dance and recognizing that its origin is Bolivian,”says this folklorist, today is Chairman of the Board of the Morenada, that it already has 25 years of activity in the city of La Paz. Moises, the youngest of the brothers is now dedicated to teaching, highlights the joy that spread this dance and believes that it must revalue it more. With taste for folklore in his veins he founded a fraternity who dances the dance of the “tobas” for 25 years. Lydia, dedicated to her house chores, recalls with nostalgia and emotion the years she danced as ‘male caporal’. Although they are surprised by the luxury that now incorporates the clothing of the hundreds of groups that dance caporales, also admire the changes which has had the wardrobe for women who are part of the dance and go alongside the caporal. 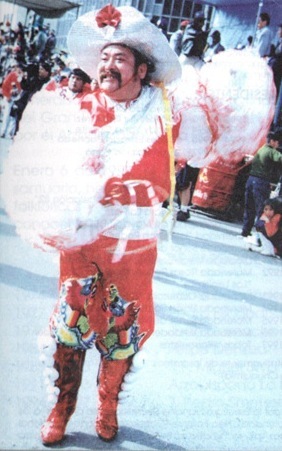 Despite the passage of the years, the Estrada Pacheco are still dancing and are ready to show off their white shirt with red tulle sleeves, their white trousers with “colan”, their sash band with the colors of the Bolivian flag, in addition to the inevitable hat, a whip and their boots with rattle-bells. They maintain joy, Jorge and Carlos Estrada Pacheco ensures to feel excited and proud of having contributed to the creation of the dance “los caporales”. In their hometown, they showed the costumes and part of the steps of this transmitting folk rhythm. 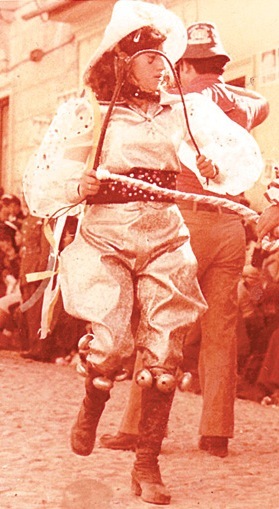 With the pace in the veins, Jorge, Lidia and Carlos Estrada Pacheco displayed some of the decorative elements used in presentations of this folk dance. Los caporales clothing has incorporated luxurious decorative elements with the passage of the years. It achieved great impact. This is the dress that was initially used in the caporales dance. It didn’t have many pompous details. Dressed as a male caporal, Lydia Estrada Pacheco decided to use the caporal man costume during one of the presentations of yesteryear. Folklorist of heart, Victor Estrada Pacheco in one of his presentations. His brothers recall with nostalgia his departure [passing]. With its own details. This is the costume that Remy Estrada Pacheco wore on one of the folk entries. 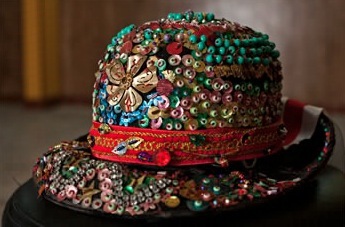 One hat that the Estrada Pacheco sisters, wears sequins and embroidery by hand. The whip or “chicotillo” is one of the inevitable elements in the dress of the caporal. It is a symbol of command of that character that represents to the mestizo or mulatto, foreman of the black slaves brought to Bolivia in the colonial era. Whip or “chicotillo”, includes various accessories. Boots with bells are one of the characteristic elements of the dress of the caporal. With the passing of the years, dancers have been incorporating new decorative elements to give more elegance to their presentation. July 16, 2012. 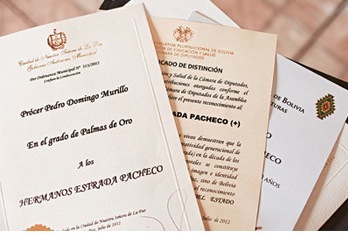 The Estrada Pacheco brothers received the award Procer Pedro Domingo Murillo in the degree of Palmas de Oro by the Municipal Government of the city of La Paz. July 18, 2012. The Bolivian Government, through the Ministry of Cultures, delivered an honorary recognition to each of the Estrada Pacheco brothers for their promotion of the Bolivian culture as promoters of the caporales dance. The award was handed by the Deputy Osvaldo Guillermo Torres of the circumscription of the Gran Poder zone [vicinity, neighborhood]. Events. They were invited to folk events in neighbouring countries where they also received awards. Among them the Andean Carnival, in Arica, Chile (2011 and 2012) and dances festivals in Ecuador and Cusco, Peru (1975). Actions. The importance of los caporales within culture and Bolivian folklore dance has been revalued at a series of public and private initiatives. Thus seeks to establish sovereignty over the cultural expressions of the country. On June 14, 2011, the Bolivian Government approved the law No. 137 attesting to the dance caporales as part of the Cultural Heritage and intangible of the plurinational State of Bolivia. It was entrusted to the Ministry of Cultures for the registration, cataloging, and issuance of the respective certificate of that heritage. Authorities of the Ministry of cultures and the post company of Bolivia (Ecobol) presented on July 24, 2011 five stamps in the collection heritage dances of Bolivia, which include caporales, besides the morenada, kullawada, llamerada and ch´utas. On that occasion, it was announced that 100,000 pieces of that first collection of stamps (20,000 for each dance), elaborated in gummed coated paper and cost between Bs0.50 and Bs10 would be printed. The Bolivian organization of defence and dissemination of Folklore (Obdefo), founded in 2004, organized various activities for the promotion of the Bolivian origin of Los Caporales dance at national and international levels. On December 4, 2005 tried, though unsuccessfully, to beat a Record Guinness and brought together 3,000 caporales who danced for two hours on the paseo El Prado of La Paz. In July 18, 2010, organized the ‘world Caporales event’ that got about 20,000 dancers to participate simultaneously in 4 continents and 18 countries and 40 cities. Napoleón Gómez, President of Obdefo and director of the Pasion Boliviana radio [Bolivian Passion radio] published in 2010 the book the “Caporales 100% Bolivian” who relates the origin and expansion of this dance from the feast of Gran Poder throughout Bolivia and other countries. That publication recognizes Bolivian brothers Estrada Pacheco as the creators of the same. 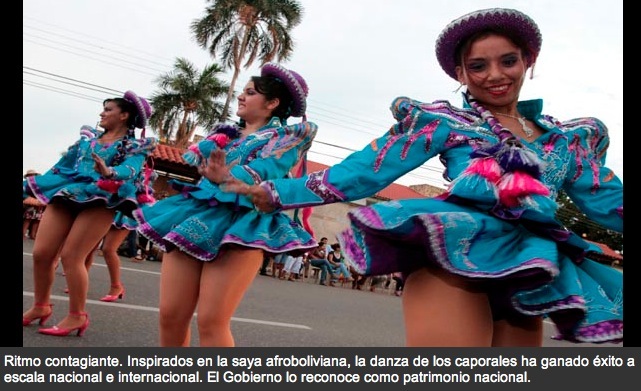 It recounts details of the massive gatherings of caporales organized, it reflects on the current situation of this dance and warning of the risk of misappropriation of the dance by groups of neighbouring countries which want to present it as their own. The participation of the Estrada Pacheco brothers during folk entries in the country and abroad got standing ovations by the public. Luxurious and colorful. 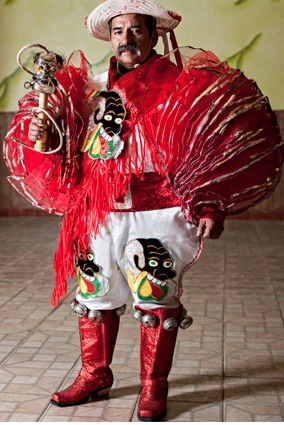 This is the current suit that the Estrada Pacheco brothers used to display the dance of los caporales in events when they were invited. Characteristic elements. The wide-brimmed hat, whip and boots with bells can not miss in costume. Character. Los caporales dance represents the mestizo or mulatto who was the foreman of the black slaves brought to Bolivia during the colonial period. 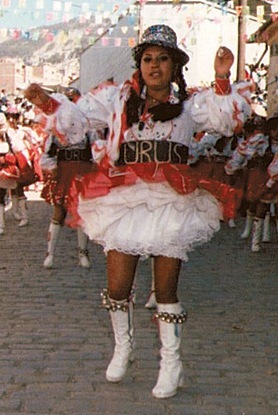 The dance of the “negritos” served as the basis for its music, which was initially based on adaptations of huaynos [huayño: another type of Bolivian folk music]. Dance. Following the presentation of a set of saya in which that character appears, the Estrada Pacheco brothers decide in the 1970s to create a new dance inspired by the caporales, that carries the same name. Spectacle. Today this is one of the dances most expected and applauded in country folk entries. To the beat of drums and drums of a music band, dancers come to display their acrobatic steps that immediately captivate the public. Clothing. The man uses a wide-brimmed hat shirt with loose sleeves, diver, belt, whip and boots with rattle-bells. The woman wears a wide sleeve blouse, a skirt that was shortened over time, high heel and hat. Kudos to the Estrada Pacheco brothers, and I welcome them to The Hall of Bolivian Fame under History and Heritage! !